Whether you’re moving from your country home to a downtown apartment or moving in with a significant other, downsizing is just another adventure in the moving process. And when you team up with the professionals at StorQuest, we’ll help you get your moving done quickly so you can get back to what matters most. Here are a few steps to help you breeze through the transition. You can only push off the decluttering for so long, so what better time to start than now? Even if you don’t plan to move for a while, tackling one room or a closet at a time is a great way to avoid the stress of moving day. Starting early gives you enough time to figure out what you need and what you don’t. If you’ve already purchased or put down a security deposit for your new home, you’re off to a good start. Head on over to your new home and take some quick measurements of the rooms to get an idea of what will fit and what you need to get rid of. By understanding the layout of your new home from the beginning, you’ll have extra time to sell some furniture and avoid the hassle of moving it if it doesn't fit. Once you’ve ditched the items you no longer need, you still might find yourself with too much stuff and not enough space. Even if you’ve stopped by your new home to take some measurements, it’s tough to tell if all of your items are going to fit until you’re unpacking. This is where StorQuest and its many locations across the country can help. We offer month-to-month rentals which will give you enough time to decide if you’re going to need more space. Once you’ve made your transition into a smaller home and trimmed your belongings down to the things you need, it's time to develop a new approach for what you bring into your home. With a smaller amount of space, things can get cluttered much quicker and the last thing you want to do is restart this whole process when the next move comes around. Live a balanced life and when you purchase new things don’t forget to get rid of a few things in return. Stay organized, stay balanced, and enjoy another beginning in your new home. Need somewhere to store your furniture until you move into your new home? 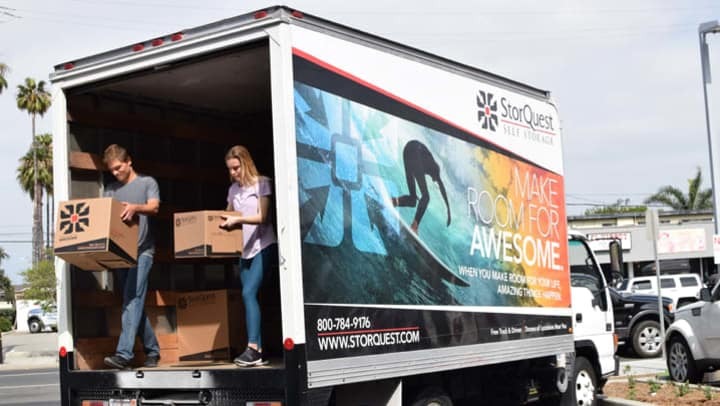 StorQuest offers a variety of units and sizes across the country to help make more room in your life for awesome. Give us a call today to see how we can help.